In this post, the Law Librarian must get rather “librarian” over the subject of overdue library books. Private bar members comprise our largest group of borrowers, and we are happy to report that most are very conscientious about the safe care and timely return of our books. We are faced with a challenging problem, however, in the cases where books are either not returned, kept far past their due date, or brought back damaged. The problem becomes more serious (i.e. expensive) when measures such as phone reminders, written reimbursement demands, and suspended borrowing privileges have failed to get the materials back. Theoretically, we might have some strong-arm options to ensure safe and prompt return of our books. After all, damage or detention of library materials is a petty misdemeanor under Minnesota law. It is also professional misconduct in Minnesota for a lawyer to either “commit a criminal act that affects adversely on the lawyer’s honesty, trustworthiness, or fitness as a lawyer,” or to “engage in conduct that is prejudicial to the administration of justice.” Minn.R.Prof.Conduct 8.4(b) and 8.4(d). There is always the option of seeking a judgment of money owed in conciliation court. 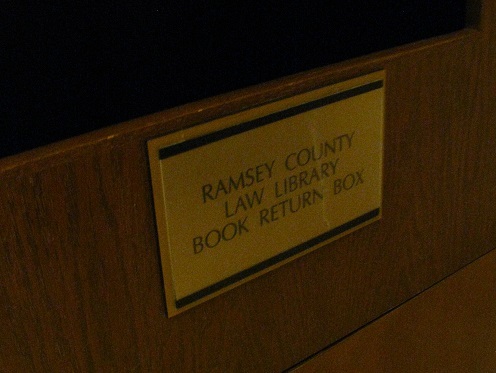 This was once done by the Hennepin County Law Library, wherein a lawyer’s failure to repay outstanding library fees ultimately became part of a disciplinary case against him. The State Bar of California even disbarred an attorney for offenses that included failure to return overdue books to the Fresno County Law Library. One memory even survives of a county law librarian in Fort Worth, Texas who sent taxis for overdue books and billed law firms for the necessary fares. Measures like this shouldn’t be necessary. Our preference is not to threaten borrowers with litigation or physical repossession of materials. We prefer to remind users of why we are here, and that our purpose requires that we get overdue materials back. Minnesota county law libraries are organized and governed under Minn. Stat. §134A. The terms of this statute allow our library a home in the courthouse, and provide for our heat, light, and cleaning service. Court filing fees are also collected to fund the library’s operation. In short, we subsist on public funds so that we might provide a much-needed public service which “shall be free.” (To compare, other states might have county law libraries operating on a subscription, or “members only” basis.) We think these statutory provisions for free law library service make Minnesota special, but it requires that our materials be fairly shared among our users. This is simply not possible when our books disappear, are kept for months on end, or are repeatedly “sat on” for lengthy periods of time by a single user. So please. Return your library materials. We need them back so that others can use them, too.